Catholicism, at its very root, had at best an ambiguous, at worst a hostile attitude to trade and all forms of economic activity that led to profit. A trader can seldom or never please God; therefore, no Christian ought to be a trader; or, if he will be one, he should be cast out from the church of God. Given this, it should not surprise us that the deeply Catholic Austrian Empire was economically backward by the standards of the times. Plunder, conquest and rent-taking were acceptable, whereas trade, manufacture, earning money and loaning it out at interest was shameful. These attitudes, combined with an extremely rigid, feudal class system that also embedded the Catholic Church into the social structure were a great problem for industrial, technological and commercial development. Technological and commercial talent is not exclusively found in the second, aristocratic, estate – quite the opposite – and the stranglehold that the class system had on innovation was very strong. Business enterprise is not going to flourish in a situation where its status is held to be so low and even to be reprehensible. Labour was only just tolerated or even held in outright contempt in Catholic theology. It was certainly not a necessary component of salvation. Derived from the biblical Third Commandment the Catholic Church traditionally forbids 'all unnecessary servile work' on Sundays and feast days. Remember the sabbath day, to keep it holy. 9 Six days shalt thou labour, and do all thy work: 10 but the seventh day is the sabbath of the Lord thy God: in it thou shalt not do any work, thou, nor thy son, nor thy daughter, thy manservant, nor thy maidservant, nor thy cattle, nor thy stranger that is within thy gates. The explanation of what precisely is meant by 'servile work' and on what specific occasions it is permitted to Catholics is outside our scope, but the implication is clear: work is fundamentally unholy. In the Catholic Church of the time an economically unproductive life of prayer and meditation was more likely to get someone to heaven than a life of financial betterment for oneself and others. Abstinence, self-inflicted suffering and an adherence to ritual were much more highly valued than economic activity. The Catholic Church praised all detachment from the means of production and the creation of wealth, valuing mendicant monks more highly than workers and employers. The catalogue of saints contains intellectuals, aristocrats and penniless hermits, no merchants or traders. Cecco del Caravaggio (fl. 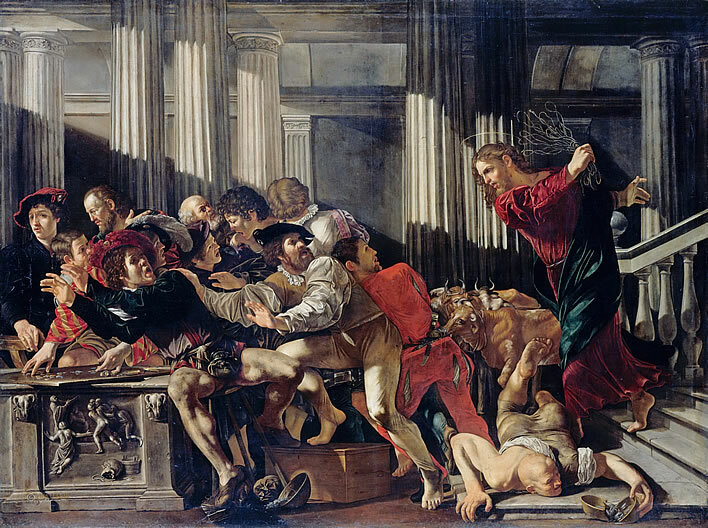 1610-1620), Christ driving the moneylenders out of the Temple (?1610-1620). Image: Staatliche Museen zu Berlin. The painting is based on the Bible, John 2:13-16: 13 And the Jews' passover was at hand, and Jesus went up to Jerusalem, 14 And found in the temple those that sold oxen and sheep and doves, and the changers of money sitting: 15 And when he had made a scourge of small cords, he drove them all out of the temple, and the sheep, and the oxen; and poured out the changers' money, and overthrew the tables; 16 And said unto them that sold doves, Take these things hence; make not my Father's house an house of merchandise. Isolated moralists … accepted the first flowerings of capitalistic business forms as a given and tried to demonstrate they were moral, necessary for trade and that such industry was a legitimate source of profit and morally inoffensive – not without opposition – but the 'spirit' of capitalist enrichment was rejected by the dominant teaching as turpitudo [base, repellent], or at least without positive morality. A moral viewpoint such as that of Benjamin Franklin would have been simply inconceivable. The clerical attitude was even shared by capitalist circles themselves insofar as they rested on doctrinal tradition: at best their life's work was something morally indifferent, tolerated, but nevertheless, because of the continual danger of transgressing the Church's usury ban, a danger to salvation. Considerable sums flowed … on the death of rich people as 'conscience money' to Church institutions, in some circumstances even back to earlier debtors as the repayment of ill-gotten usura. Capitalism exists as an individual activity – a calling – and cannot be replaced by top-down management and moral, 'enlightened' decrees. Unfortunately for Austria, this is exactly what Maria Theresia and her successors tried to do. In economic terms such top-down, centralised control is known as 'mercantilism'. It is essentially the economic system used by all autocratic, absolutist states. There was no place in the Austrian Empire for people like Benjamin Franklin. He would have been persecuted by the clerical first estate, viewed contemptuously by the artistocratic second estate and been spied upon by a government which would censor and suppress his attempts at publication. His destiny would be prison, deportation or even burning. Franklin, Jefferson and the other Founding Fathers of the new country were lawyers, tradesmen, farmers and intellectuals, the great architects of a state created in the image of the enlightenment. Measured, rational people, in search of the public good and striving to do good works on Earth. A state that rejects and repels people like these cannot survive in the long term. Within the space of a little over a hundred years, from Maria Theresia's accession to the revolution year of 1848, under her and her 'enlightened despot' successors, Joseph II, Leopold II and Franz II, the Holy Roman Empire would slide into being a rickety non-entity. Sixty years after that it would cease to exist, destroyed in the world war it was instrumental in provoking through its own rigidity and stupidity. In fact, history would have taken a completely different turn and Austria would have had a different future had Protestantism managed to take hold. Austria, Protestant! What limitless material for observations, for manifold conjectures, for new worlds! Homo mercator vix aut nunquam potest Deo placere; et ideo nullus Christianus debet esse mercator; aut si voluerit esse projiciatur de ecclesia Dei. The statement in the Decretum Gratiani is the summary of centuries of statements against the taking of interest and the carrying on of trade, starting with Gospel of Luke (6:34), through the Councils of Nicea (775), Lyons (1274) and Vienna (1310) and backed by the authority of Jerome, Augustine, Cassiodorus, John Chrysostom, Aquinus etc. The Decretum Gratiani was not simply a medieval phenomenon. It lasted as binding church law for around seven centuries until it was superseded by Code of Canon Law (Codex Iuris Canonici) in 1918. ^ The Bible, Exodus, 20:8-10, Authorized (King James) Version. Einzelne damalige Ethiker vor allem der nominalistischen Schule nahmen die entwickelten Ansätze kapitalistischer Geschäftsformen als gegeben hin, und suchten sie als statthaft, vor allem den Handel als nötig, die darin entwickelte 'industria' als legitime Gewinnquelle und ethisch unanstößig zu erweisen: – nicht ohne Widerspruch, – aber den 'Geist' des kapitalistischen Erwerbes lehnte die herrschende Lehre als turpitudo ab oder konnte ihn mindestens nicht positiv ethisch werten. Eine 'sittliche' Anschauung wie die Benjamin Franklins wäre einfach undenkbar gewesen. Dies war vor allem die Auffassung der beteiligten kapitalistischen Kreise selbst: ihre Lebensarbeit war, wenn sie auf dem Boden der kirchlichen Tradition standen, günstigenfalls, etwas sittlich Indifferentes, Toleriertes, aber immerhin schon wegen der steten Gefahr, mit dem kirchlichen Wucherverbot zu kollidieren, für die Seligkeit Bedenkliches: ganz erhebliche Summen flossen, wie die Quellen zeigen, beim Tode reicher Leute als 'Gewissensgelder' an kirchliche Institute, unter Umständen auch zurück an frühere Schuldner als zu Unrecht ihnen abgenommene 'usura'. ^ In fairness it has to be noted that the bloodthirsty Jacobins of the French Revolution replaced the pictures of saints on the walls of the Jacobin Club in Paris with a portrait of Benjamin Franklin, among others. If only history were simple! ^ Adolf Glassbrenner, Bilder und Träume aus Wien, Wien : Rikola-Verlag, 1922, p. 192. In der Tat, die Geschichte würde einen ganz andern Gang genommen haben, für Österreich eine neue Zukunft entstanden sein, wenn der Protestantismus hindurchgedrungen wäre. Österreichisch-protestantisch! Welch ein unendlicher Stoff für Betrachtungen, für die mannigfaltigsten Vermutungen, für neue Weltgestaltungen! O Bouquois' Dragoner! Mein Herz ist schwer, wenn ich an euch denke!